The design world has changed in recent times. As Customers & Service providers are located in different parts of the world there is a need of collaborative working environment. Onshape is the first and only full-cloud 3D CAD system that lets everyone on a design team simultaneously work together using a web browser, phone or tablet. Jon Hirschtick, founder and Chairman at Onshape. No need to install bulky CAD Software on your computer and sit at one location. You simply need to log in to your CAD system and use CAD Software on the go on different platforms. I was fascinated with this idea that it’s free, no need to install any software on your computer and easy sharing access. Besides this I saw Couple of Essential Training Series videos from Onshape and I couldn’t resist myself from signing up to Onshape .! Today I signed up to their Free Account to know more about them. You will see your account info as below. As on 24th nov 2015 Onshape is in beta stage. Inside your account you will see lots of Pre-loaded Public ‘Tutorials & Samples’ documents listed as mails inside inbox and preview on right side of your account page. On Top left cornet you will find buttons to ‘Create’ a new Onshape document abd Import document file(s) . If you are happy with Free or want more functionalities and space then you can upgrade to Pro version anytime by clicking button on bottom left corner of page. You can select plan type as ‘Individual’ or ‘Company’. Also, You have options to pay monthly or yearly. Now go back to main page. How to Create new Document in Onshape ? Your First Onshape Document will open as below ! 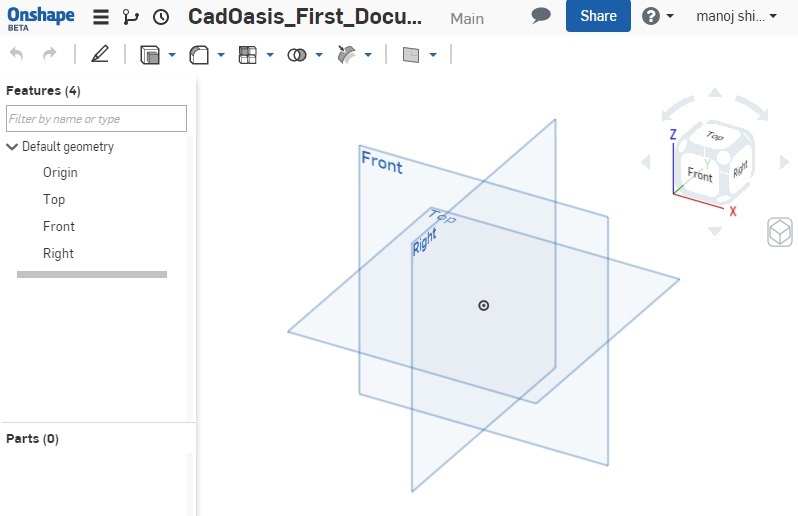 Stay tuned for more Onshape tutorials on CadOasis ! A little more background about Onshape would be helpful. What prompted you to review it? Despite the provocative title, until I read the whole article I wasn’t even sure what Onshape was. I Will update more background details about Onshape in this post only. We are comparing desktop based cad to cloud based cad and we will publish our comparing post soon but we need to study both sides very well.